Sharp delivers a breakthrough in capacitive touch-panel technology with the PN80TC3. Featherlight touch and so intuitive and responsive, it feels like writing on a conventional whiteboard. 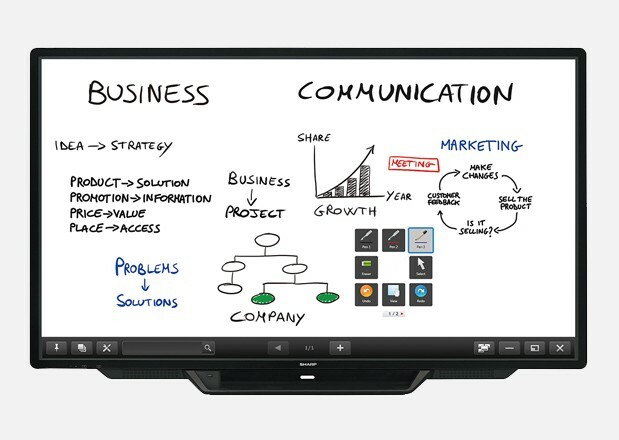 The PN80TC3 revolutionises the way you collaborate with colleagues or classmates. It allows you to display and freely annotate a huge variety of documents, with up to four people able to write onscreen at the same time. The PN80TC3 lets you capture ideas at the moment of creation. Recognising up to 10 touch points, it allows up to four people to write at the same time with a finger or touch pen. Each pen has a thin 3.5 mm tip that makes it easier to add detailed notes that remain legible when printed out. Note: Two touch pens are bundled with the PN80TC3. The new touch pen links with SHARP Pen Software to help you write with an uninterrupted flow. In overlay mode, you can write onscreen annotations directly onto photos, videos, PDFs, and documents such as Microsoft® Excel®, Word, and PowerPoint®. Text and graphics written on the board can be stored in USB memory (saved as PDF, BMP, JPEG or PNG files) or sent directly via e-mail to selected recipients. Pressing the Touch Menu button brings up an onscreen menu that lets you easily switch input sources, change volume level, or turn the touchscreen function on and off—all from the front of the PN80TC3 and all without the need for a remote controller.